We are visiting New Hamsphire for a couple of days and because Bae is an outdoorsy guy, we headed to the white mountains. 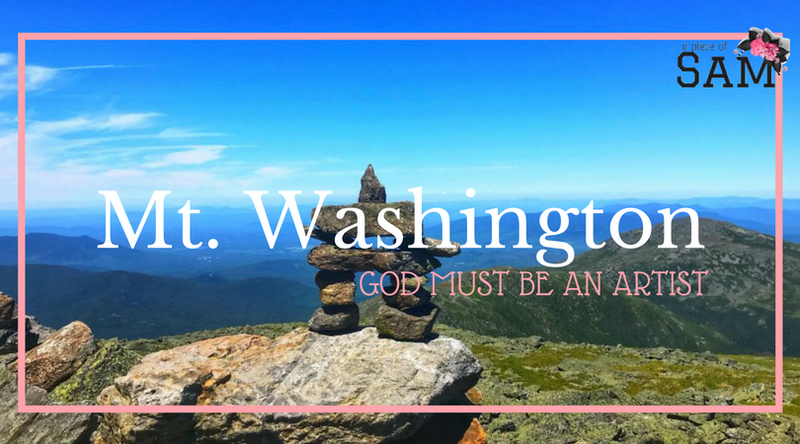 We decided to head to a very popular tourist attraction; Mount Washington, which is the highest peak of Northeastern United States at 6.288.2ft. It is located at the presidential range of the white mountains in New Hampshire. It holds the record for the highest wind ever observed. We decided on driving up the mountain to the summit, although there is a shuttle service that transports people to the summit. We paid an access fee of $40 for two people and the car. We were given a sticker which read ”this car climbed Mt Washington”. I didn’t think much at the time I saw the sticker but I later found out that driving to the summit and back alive is a HUGE achievement because the ride up the mountain is DEADLY! It is not for the faint at heart or feeble-minded. We began our ride on a narrow windy and curvy road two-way road without side rails and pavement markings. It was manageable until we meet other cars descending the mountain. We had to come to a complete stop a couple of times to let cars go by. We stopped at about halfway into our ascent and it was gorgeous, God must be an artist! The beautiful views of Mt Washington. We continued our drive on this winding road which was once an engineering marvel of its time but now a treacherous and that’s when it got tougher. We couldn’t tell if there were oncoming cars and I couldn’t look out the window into the steep cliff. As we got higher we got the illusion of driving into the horizon where earth meets the big sky, we both experienced ear blockage due to high altitude. My fear response was amplified by the sudden appearance of an Escalade, we could only just wait for it to go by, as an attempt to keep driving or swerve would send us spiraling down the cliff. I was scared out of my wits, a wave of fear rushing through my body. I was petrified. So many scary thoughts crept into my mind, my imagination was running wild.I remembered a story I heard of someone who was on cancer remission and decided to do a road trip and had an accident and died(God rest his soul). That was when I started crying (luckily I had sunglasses on because I didn’t want to scare Bae, he had to drive and not be distracted). Then in a bid to be conversational, Bae said it seems we are driving into heaven…OMG, I could hear my heart pounding…… people have to die to get to heaven right?? I held on so tightly to my seat and door and just started praying. We finally made it to the top, at this point I was so frightened that I needed to use the restroom😂😂😂😂. But that quickly passed as we began enjoying the awesome views. At the summit, there are shops for snacks, a museum, restroom and the tip-top house (historical site). The descent wasn’t as bad, but I still grabbed on to my seat through it. It was a mind-boggling, yet exciting experience. I’m thanking God for our protection through the ride. I am also super proud of my Bae who has proved to be a good driver😘. Fear inhibited me from maximally enjoying this awesome opportunity and life experience. Thankfully I didn’t act irrationally. Has fear of the unknown deprived you of enjoying anything you still regret? Kindly share your experiences. Wow!! Your narrative brings it all alive. Yours truly is adventurous and would definitely enjoy every bit of this!! It is awesome, I bet you will love it! I think everyone should try it at least once…. Wow! What a beautiful place! I would love to go paint there. Thanks so much for sharing those beautiful pictures and your experience with us!